My wife had uterine cancer 8 years ago. Dr. Milne put her on Poly-MVA back then. She uses it to this day. Poly-MVA has paid off so far for both of us. We would be afraid to stop, quite frankly. We live a healthy life style going to the gym 4 to 5 times a week, eating organic as much as possible and lots of other supplements along with Poly-MVA part of our daily practice. This is my experience in the last 12 months using Poly-MVA. April 17, 2008 I was diagnosed with stage 4 cancer in my colon, uterus , and ovaries. My Doctor first considered surgery but since the cancer had gone to stage 4 he wanted me to go through chemotherapy. 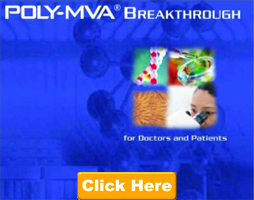 Instead, I began taking POLYMVA on May 21,2008. I took 3 IV’s of Poly-MVA a week plus 12tsp a day on opposite days. This was a total of 48 Poly IV’s. After 6 months of treatment, a pet-scan showed signs of the colon tumor growing. I began another round of 48 Poly-MVA IV’s. After due consideration I decided on chemotherapy. I started chemo January 8, 2009. I continued my Poly-MVA during chemo. I was in the midst of chemotherapy for late-stage choriocarcinoma when a close friend burst through the door with a bottle of polyMVA. "The only reason the bottle is open is because I had to let them smell it to get it through airport security!" she shrieked, "You HAVE to take this." As soon as I felt something coming on, I took my PolyMVA, coQ10 and effervescent vitamin C, and the symptoms disappeared like magic. Amazingly, everyone else got sick, including my family who was looking after me. The next thing was that, since I am small boned and likely to have osteoporosis later in life, had decided not to take any more steroids (prednisone) with my chemotherapy...... the nausea was so bad, along with the sores in my mouth, I couldn't eat. What I found was that, about half-an-hour after my dose of PolyMVA, I was not only able to eat, but I was able to keep the food down. Finally, in February, just 16 weeks after I’d started chemo, my cancer markers were practically back to normal. I told my doctors I’d had enough, I wasn't going to have any more standard medicine. My doctor looked at me and said, "If you walk out of here, you'll be dead in 12 weeks." I said, "If I’m dead, I have nothing to worry about. But if I’m alive, I care about my quality of life." ....... 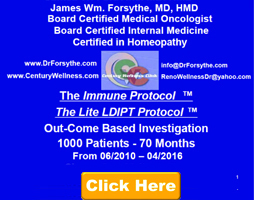 When I came back to my doctor after a month, my cancer marker hormone levels were totally normal. I had no bleeding. I asked the doctor about exercise - and she said, well, most people start slowly. I told her that, along with the pilates, I was swimming half-a-mile three to four days a week. I just found I needed an occasional nap in the afternoon. Her mouth dropped open. In December of 2009, I was diagnosed with stage 3 uterus cancer. I want to give people hope that are fighting cancer. My Doctors had a meeting about me and said I was a very sick lady, with very low red blood levels. They started me on radiation after my operation. It was at this time a friend told me about PolyMVA. Soon after starting it, my blood count went up to normal. I was never tired during radiation and was able to continue with life as normal. My friends and family were shocked at how well I was doing because I did not look sick and remained active. At my 1 year checkup my doctor said I am doing well.